nB nanoScale Biomagnetics introduced in 2008 the DM100 Series, the only integral, immediate and reliable solution for laboratory tests on magnetic hyperthermia and magnetic heating of nanomaterials at the time. One sole equipment to apply, measure and analyze the results. One model for every application. The DM100 Series gave the answer to all your needs in Magnetic nanoHeating instrumentation either with its series models or custom made applications. After a decade of perfecting the concept and the technology, we introduce to the market the new D5 Series improved with unlimited number of frequencies, more expandable and more affordable! The design conceptualization of the DM100 series emerged from the real need of the Magnetic Hyperthermia lab of the Institute of Nanoscience of Aragón (Spain). The specific needs involved in the process of applying a magnetic field, measuring and analysing the results were thoroughly examined and approached one by one, leading to an integrated and final solution that guaranteed the highest standards in Magnetic Hyperthermia research. 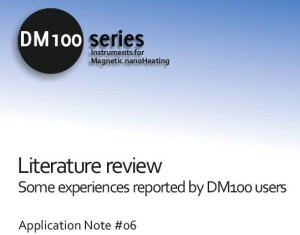 The results achieved with DM100 Series are now endorsed by published results on characterization of nanostructured materials, experiments with cellular cultures, parasitology, among other fields. Check out the literature review of some applications reported by our DM 100 users.